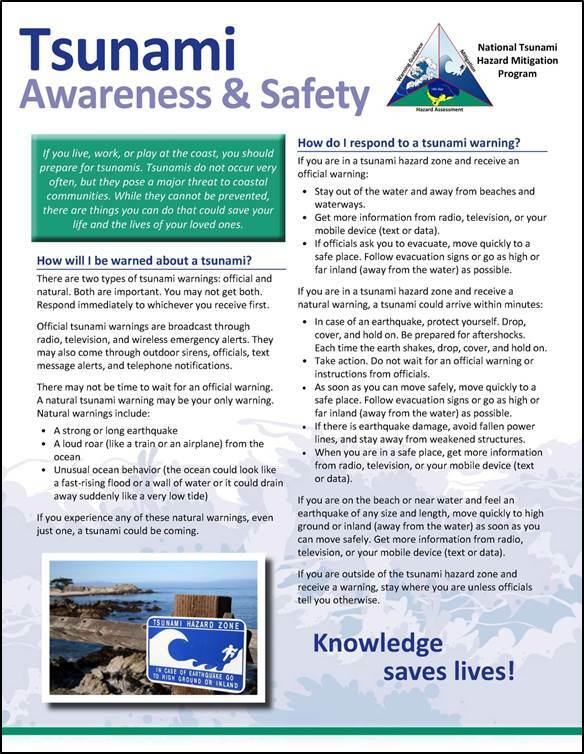 Produced by the Mitigation and Education Subcommittee, the NTHMP Tsunami Awareness and Safety Fact Sheet is designed for NTHMP partners and other interested parties to use to promote tsunami awareness and safety among their constituents. White space at the bottom of each allows for the addition of logos and/or contact information. The fact sheets are available for download only. No printed copies are available. Permission is not required to add a logo and contact information, duplicate, or distribute the fact sheet. Content may not be changed. For tsunami awareness and safety resources from NTHMP partner states and territories, see the Partner Web Resources page.